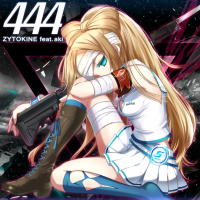 444 is a song part of the SOUND VOLTEX IV Production Confirmation Commemorative Original Song Contest (SOUND VOLTEX IV 制作決定記念 オリジナル楽曲コンテスト). It was added to SOUND VOLTEX IV HEAVENLY HAVEN on September 15th, 2017. Utsurogatari Kemuri appears in 444's jacket. 444's title is read as "force" (フォース) . Congratulations, SOUND VOLTEX IV has started! I am thankful for my third time being accepted in VOLTEX, thank you! I asked aki, who has worked as a vocalist for many years, to be my vocalist and went for a high speed pop full of synth sounds! This page was last edited on 3 March 2019, at 17:52.